By Eric I. Newman, M.D., Jay Meisner, M.D., Ph.D, Mark Guelfguat, D.O. 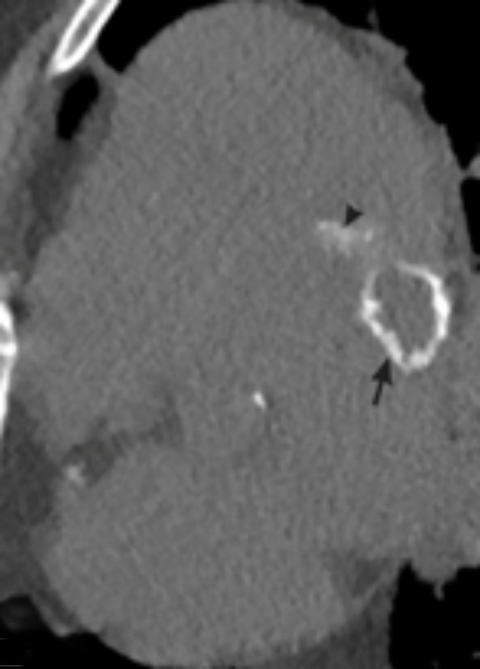 A 74-year-old man presented with a multifocal acute cerebrovascular accident. Laboratory data revealed normal renal function and serum calcium level. Chest radiograph demonstrated an enlarged cardiac silhouette, but was otherwise unremarkable for age. A cardiac source for the emboli was suspected, and an echocardiogram was requested. Echocardiogram showed an intracardiac mass (Figure 1A), which was further investigated with computed tomography (CT), (Figure 1B, 1C) and MRI (Figure 1D). Lobulated mass contiguous with the mitral annulus and posterior leaflet (CT and MRI). The differential diagnosis for a mass closely related to the mitral annulus differs from the nonspecific cardiac mass differential. The most common lesions associated with the mitral annulus include caseous calcification of the mitral annulus, myxoma, para-annular cyst, annular abscess, and infectious endocarditis. Cardiac myxoma represents the most common primary cardiac tumor in adults. It is typically a polypoid, intracavitary left atrial mass that arises from the interatrial septum, but it may originate in any cardiac chamber.4,5 Most affected patients present with at least one feature of a classically described triad that includes cardiac obstructive symptoms, constitutional symptoms, and embolic events. On echocardiogram, blood cysts appear as hypoechoic cystic lesions, which may contain internal echoes, often with smooth outer surfaces. On CT, they appear as hypodense cystic masses with or without wall calcification. On MRI, blood cysts demonstrate low to intermediate signal intensity on T1-weighted images and high signal intensity on T2-weighted images without enhancement. While metastases represent the most common cardiac neoplasms, they were not included in this differential based on the imaging appearance of the mass in the illustrative case, as well as the clear association with the mitral annulus. The differential diagnosis for a mitral annular mass includes a variety of entities, to include CCMA, myxoma, peri-annular blood cyst, abscess, and infective endocarditis. The imaging appearance of the cardiac lesion presented in this case favors CCMA based on the lesion morphology, location, and presence of rim calcifications. CCMA may be distinguished from myxoma based on the fact that myxoma is usually mobile, pedunculated, and attached to the myocardial wall. Unlike CCMA, myxoma lacks peripheral calcifications, rarely involves the valve, and is highly vascular. Blood cysts appear as hypoechoic cystic lesions on ultrasound with smooth walls and hypodense cystic masses on CT with or without wall calcification; when wall calcifications are present, the lesions can mimic CCMA. Mitral annular abscess would not be expected to show extensive peripheral calcifications on CT. Lastly, in cases of infective endocarditis, vegetations typically affect the valve leaflet, rather than mitral annulus. Martinez-de-Alegria A, Rubio-Alvarez J, Baleato-Gonzalez S. Caseous calcification of the mitral annulus: a rare cause of intracardiac mass. Case Rep Radiol 2012;2012:596962. Mallat N, Limeme M, Zaghouani H, et al. Caseous calcification of the mitral annulus on MDCT: a rare intracardiac mass. Acta Radiologica Short Reports 2013; 2(7):2047981613502177. Akram M, Hasanin AM. Caseous mitral annular calcification: Is it a benign condition? J Saudi Heart Assoc 2012;24(3):205-208. Grebenc M, Rosado-de-Christenson M, Green C, et al. 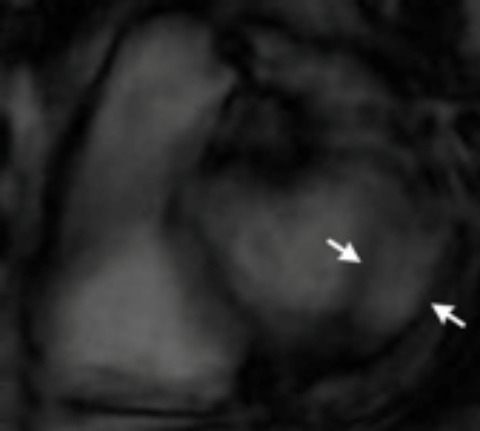 Cardiac myxoma: imaging features in 83 patients. Radiographics 2002;22(3):673-689. 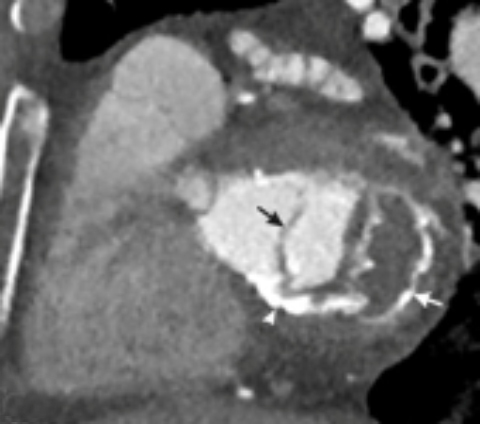 Tsuchiya F, Kohno A, Saitoh R, Shigeta A. CT findings of atrial myxoma. Radiology 1984;151(1):139-143. Park M, Jung S, Youn H, et al. 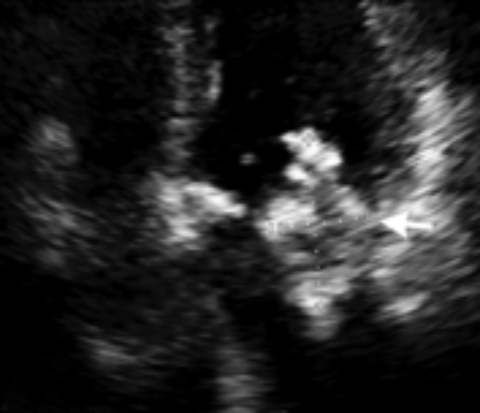 Blood Cyst of Subvalvular Apparatus of the Mitral Valve in an Adult. J Cardiovasc Ultras. 2012;20(3):146-149. McKernan NP, Culp WC Jr, Knight WL, et al. CASE 2—2012 intraoperative diagnosis and management of caseous calcification of the mitral annulus. J Cardiothorac Vasc Anesth 2012;26(2):327-332. Kim T, Jung J, Kim Y, et al. CT and MRI evaluation of cardiac complications in patients with hematologic diseases: a pictorial review. Int J Cardiovasc Imaging 2015;31(Suppl 2):159-167. Gahide G, Bommart S, Demaria R, et al. Preoperative evaluation in aortic endocarditis: findings on cardiac CT. Am J Roentgenol 2010;194(3):574-578. Hoey E, Gulati G, Ganeshan A, et al. Cardiovascular MRI for assessment of infectious and inflammatory conditions of the heart. Am J Roentgenol 2011;197(1):103-112. Newman EI, Meisner J, Guelfguat M. Mitral Annular Mass. J Am Osteopath Coll Radiol. 2017;6(2):22-24. Eric I. Newman, M.D., Jay Meisner, M.D., Ph.D, Mark Guelfguat, D.O. Dr. Newman and Dr. Guelfguat are with the Department of Radiology and Dr. Meisner is with the Department of Medicine/Cardiology at the Jacobi Medical Center, Albert Einstein College of Medicine, Bronx, NY.